I caught this article in an issue of Cooking Light and I knew I needed to share it with my fellow blueberry lovers! This magazine actually has a great summer cookbook that focuses on eating by color, and your favorite purple super-fruit made the issue. These treats will be a perfect treat for a hot summer day and it doesn’t hurt that each pop is under 100 calories! Place berries and sugar in a small saucepan over medium. Cook, stirring occasionally and pressing to break up berries, until juices release completely, 10 to 12 minutes. Cool completely. Meanwhile, place honey, 1/3 cup water, lavender, and rind in a small saucepan. Cover and bring to a boil over medium-high. Remove from heat; let stand 15 minutes. Pour through a fine sieve; discard solids. Cool completely. Stir together lavender syrup and yogurt in a bowl. 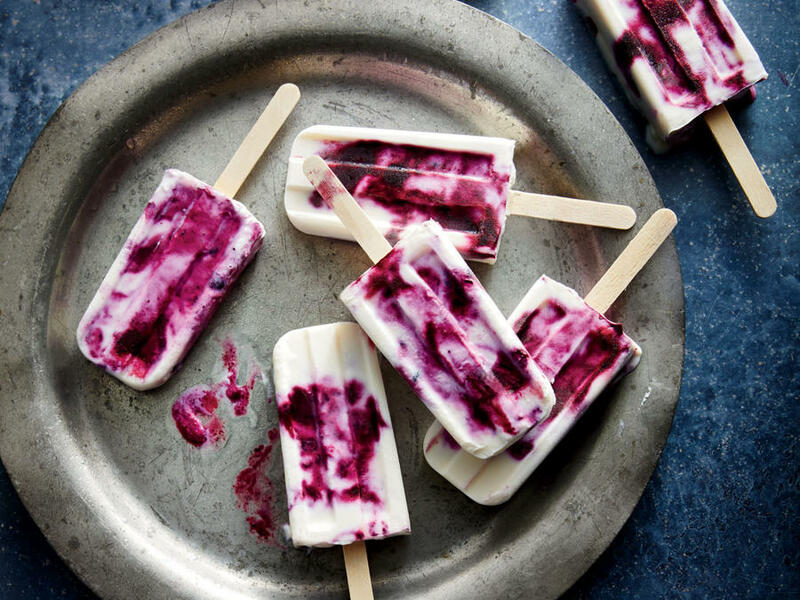 Spoon yogurt mixture and blueberry mixture alternately into 10 (3-ounce) ice-pop molds, beginning and ending with yogurt mixture. Swirl gently. Freeze until solid, 4 hours or overnight.